I first discovered “The Lazy Man’s Way to Riches” by Joe Karbo while browsing through the Nottingham Bookstore in Hamilton Square, New Jersey. This was sometime back in the mid-70’s. My father, Howard Tedder, owned the store. It was a paperback book, 6 inches x 9 inches and 3/8 of an inch thick. In the top right corner of the cover it said: $1000 Not the selling price but guaranteed to be what it is worth to you – at the very least. My father had priced the book at $5.00. (Some used copies today are listed for $25 to $50 on Amazon and Ebay.) I don’t know if he ever read it and I can’t remember if I paid him the $5.00 for it. I probably didn’t. I often took books that I liked home and brought them back after I read them. I “paid” for the books by working at the store fairly frequently, cleaning the store, and moving lots and lots of books around. 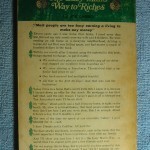 I took “The Lazy Man’s Way to Riches” home and read it and I have kept it all these years. When I am going through the books on my bookshelves to make some space, I never even consider throwing it out. I have never seen another copy of it for sale in a used book store anywhere and I have been to quite a few used book stores. 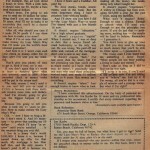 The book that I have is Copyright 1973 Joe Karbo, 17105 S. Pacific, Sunset Beach, CA 90742. The book was originally sold for $10.00 by mail order through advertisements that Joe Karbo wrote and placed in newspapers and magazines. It wasn’t sold in stores. At the time, a paperback book sold in a bookstore for around $1.95. 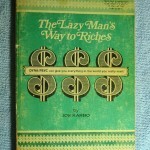 “The Lazy Man’s Way to Riches” was expensive compared to a regular paper back book. The book is divided into two parts, book one and book two. They each have eight chapters and a question and answer section. Book one talks about “Dyna/Psyc: the programmed study and practice of achieving success by the planned application of important but little understood natural laws.” It talks about an inadequate self image, fear, making lists, turning lists into goals, daily declarations, affirmations, visualization, and letting your unconscious computer (your mind) solve problems for you. The back cover of The Lazy Man's Way to Riches. Double click the image to enlarge it. Book two talks about creativity, turning problems into opportunities and the direct response business (mail order). Joe goes into quite a bit of detail regarding the mail order business and a lot of the information applies to other types of businesses as well. I think it is an interesting book, well-written, and well worth reading. Joe writes in an easy-going, friendly manner. It is as if he is right there sitting in the room with you explaining everything in person. He gets right to the point of what he wants to say and he packs a lot of good information into the 156 pages of the book. I know there is value in it and I recommend it. The book sold over 2,700,000 (2 million 700 hundred thousand) copies by the time Joe Karbo died. According to an interesting article on The Lazy Man’s Way.com, Joe died in 1980 at age 55 from a heart attack while being interviewed by a TV station news crew. I have not been able (so far) to find a newspaper obituary for Joe Karbo. The advertisements for the book are as famous as the book itself. Copywriters and advertising people to this day use Joe Karbo’s ad as an example of how to write a great ad. 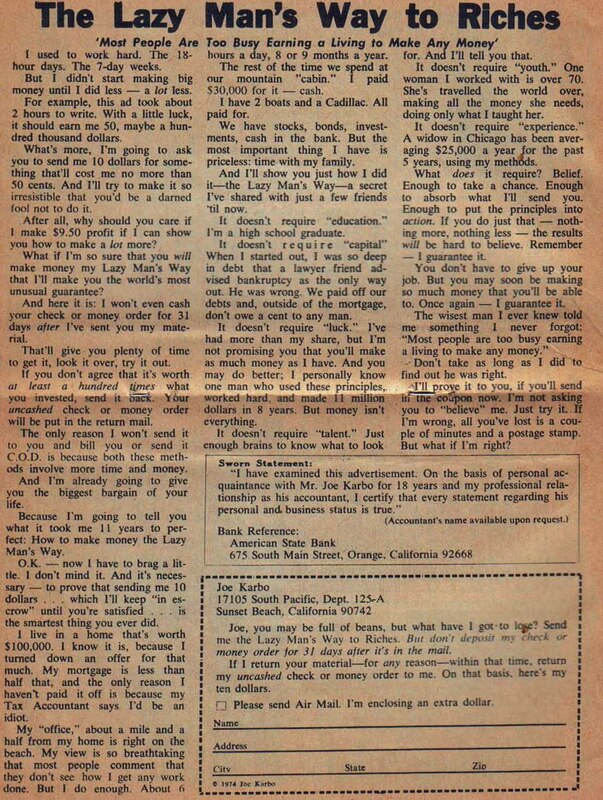 The subtitle for the ad is “Most People Are Too Busy Earning a Living to Make Any Money.” I remember seeing and reading the ads in newspapers and magazines back in the 70’s. Although I never actually ordered the book by mail, I did try my hand at mail order in the late 80’s by selling a trivia booklet that I wrote and printed. It was not a success. I can’t recall though, 20 years later, whether or not I was actually inspired to try mail order by reading “The Lazy Man’s Way to Riches” or whether something else triggered my attempt. In any case, I know that I referred to the book and used some of the mail order information in it when I was working on how to market my product. Regardless, here is a copy of the actual ad that ran in newspapers and magazines all over the country. If you have any stories or opinions about Joe Karbo and The Lazy Man’s Way to Riches or this post, I would love to hear your comments.